We have lots for you to do at Battlefield 1403, from Archie Sparrow’s new trail, to walks around the Battlefield, the Church and the Medieval fish ponds. A key is available from the shop to sign out if you wish to enter the church. Our exhibition and our falconry centre are also available to visit. Why not make a day of it and have lunch at Sparrow’s Café? There is lots to do here at Battlefield 1403 – we have walks, a visitor centre and exhibition, a falconry centre and Archie Sparrow’s trail for children. This is a visual explanation of The Battle of Shrewsbury which took place in 1403 – hence our name! The Battle of Shrewsbury was fought between King Henry IV and a rebellious faction led by the Percy family in 1403. The significance of the battle lies not just in its political ramifications as precursor to the Wars of the Roses but also in the fact that it was the first time that the English longbow was used on both sides. 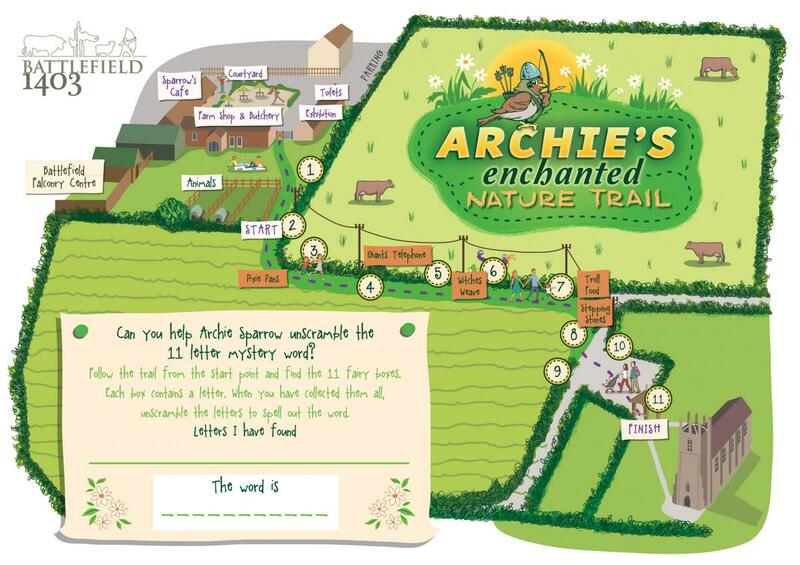 Our Archie’s Enchanted Trail has been a huge success! Come and collect activity sheets from the shop and let the adventure begin. With a bug hotel, giants telephone, pixie pans and a witches weave its the perfect way to get the creative juices flowing. Whilst making your way down to the church, don't forget to write down the letters you see on the fairy houses to spell out the special word at the bottom of your activity sheet. You'll see billy goats and big fat pigs on the way down, but be careful not to get caught by the Terrible Troll... Click on Map to view a larger image. Open all year round and absolutely free. Come along and meet the birds. We have Barn Owls, European Eagle Owls, a Steppe Eagle, Harris Hawks, and much much more. Entry is £5.50 for adults and £3.00 for children. Come along and get involved in the day to day running of the Centre. This is a great opportunity to have a full hand’s on experience capturing the medieval art of Falconry under the supervision of a recognised Falconer. You will learn how to handle a bird of prey, how to prepare a bird of prey for flying and the management of training these fabulous birds in this wonderful activity. Included in the price is a hawk walk where you will take control of a Harris Hawk for the duration of the walk. This is a full day’s activity that is packed with exciting features for the individual to experience. At the end of the day you will be awarded a certificate as a memento of the day. All equipment will be provided – a light lunch and refreshments will also be available to suit. Book a half hour or full hour bird handling session where you can get up close and personal with a number of our most spectacular birds of prey. We have a wide variety of indigenous owls and a number of owls from various regions of the world that can be handled by the participant. This is a unique opportunity to have close contact with some of the most enigmatic creatures on our planet under the guidance by one of our experienced bird handlers. You can also take photographs to capture the occasion to show all your family and friends. It’s a wonderful chance to learn more about these mysterious birds!! Hold your child’s party here at Battlefield Falconry Centre where the children can handle a variety of birds and have photographs taken. We have friendly Fiz our beautiful Barn owl, a little Kestrel called Tink and Bok our Boobok owl from Australasia for the children to get up close and personal with. The children will receive a full inter-active bird demonstration and for those who are brave enough can even have the chance to dissect an owl pellet!! Sparrows Cafe at Battlefield 1403 can provide the birthday food in the Visitor’s centre where the children can learn about the history of the famous Battlefield site. If you want we can even arrange to provide goodie bags and a personalised cake to mark the occasion. Whether an experienced photographer or a newcomer to the world of digital photography book a session to capture some wonderful shots of our magnificent birds of prey. All of our birds are very photogenic and will provide you with a number of exciting opportunities to create a perfect photo shot. We can arrange a variety of different photographic scenarios to enable you to get the best out of the session. Come along and put your photography skills to the test – you’ll certainly have a wonderful time. Take a walk along the stunning Shropshire countryside and become a falconer for the morning, flying a Harris hawk to your gloved fist while they follow gracefully through the trees. This is a wonderful chance to experience the unique bond and trust between man and hawk and get a taste for the sport of kings.